With enriched industrial experience, we have been able to offer a wide spectrum of Meter Bridge. 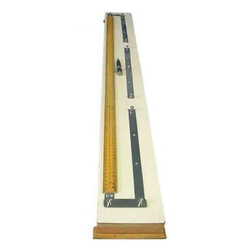 Meter bridge laminated board with boss side sun mica pencil jockey with brass fitting brass terminals. With a firm commitment to quality, we are involved in offering a wide ambit of Meter Bridge. WE OFFER METER BRIDGES AND POTENTIOMETERS WITH JOCKEY WITH 4 WIRE/6WIRE/10 WIRE. 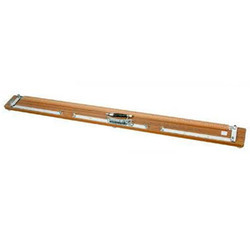 The four gap bridge has large and heavy brass strip mounted on a heavy ¾ thick laminated base of size 44 x 5 complete with pencil jockey and lead for connection. Overall dimension: 1.10 m x 100 mm x 50 mm high including terminals. Riding on unfathomable volumes of industrial expertise, we are providing a broad array of Meter Bridge. Backed by rich industry experience and market understanding, we are involved in offering a wide array of Meter Bridge With Pencil Jockey One Meter Long Sunmica Top to our valued patrons.